Depression runs in Catherine’s family. They are also one of the leading causes of depression in others. Ostensibly, she has come to her friend’s summer home to relax and get away from her troubles, but she will really just do her best to make everyone around her miserable in Alex Ross Perry’s acutely unsettling but undeniably riveting Queen of Earth (trailer here), which opens this Wednesday in New York at the IFC Center. Catherine has just been dumped by James, the boyfriend with whom she was so lovey-dovey during last year’s trip to Virginia’s family vacation home. The timing is particularly bad, coming soon after the death of her father—a tragedy made worse by the unspoken circumstances involved. Back then, Virginia did not like James at all, but she does not seem to be judging him too harshly now. As Catherine settles in, as best she can, Perry flashes back to her happier, co-dependent days with James. Virginia was not expecting her to bring him the summer prior, so she made no secret of her resentment. Catherine also immediately clashed with Rich, Virginia’s neighbor and potential love interest, who is decidedly not intimidated by artsy, pseudo-intellectuals like Catherine. A year later, James is out of the picture, but Rich is still there, expecting to get lucky with Virginia and rubbing her the wrong way. Vexed by memories and annoyed by Rich and Virginia’s insensitivity, Catherine slides deeper into depression, perhaps losing her handle on reality in the process. If you ever doubted depression is absolutely a genuine health risk, just spend some time with Queen. Many of the dangers are readily apparent, while some are eerily implied. Yet, despite Catherine’s massively unreliable POV, it is definitely fair to say profoundly bad things are going on in that summer house. You can argue how best to classify Queen, but it bears obvious comparison to Polanski’s Compulsion and Elisabeth Moss’s lead performance will completely chill you to your bones, so some might call it horror. However, it also has the uncomfortable intimacy of Cassavetes and even, Heaven help us, Ingmar Berman. Moss’s work is bold and disturbing, but tightly controlled and carefully calibrated. There absolutely no foaming at the mouth or similar such Meryl Streep shtick on display here. The film is also quite an ensemble piece, featuring first-rate supporting turns from Catherine Waterston and Patrick Fugit as Virginia and her friend with benefits. Frankly, nobody is remotely “likable” in this film, but you cannot tear your eyes away from them. Cinematographer Sean Price Williams has amassed plenty of credits (including the terrific documentary Beetle Queen Conquers Tokyo and the highly entertaining Drunk Stoned Brilliant Dead), but Queen might be the film that gets him award recognition. He gives Queen an undefinably retro look, amplifying the dramatic power with his long-held close-ups. It is a distinctive film in all senses that is likely to be regularly studied and re-examined for years to come. 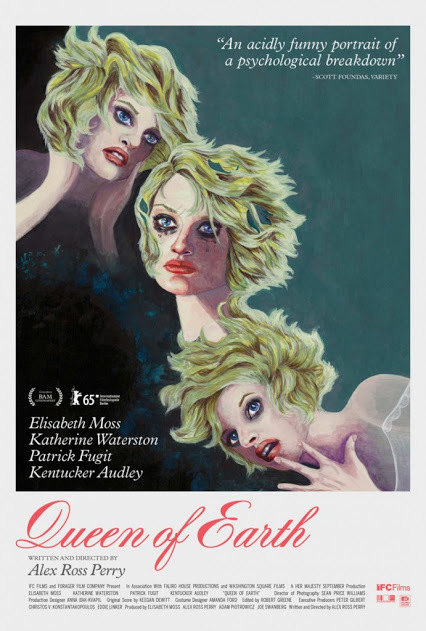 Recommended for admirers of psychological dramas (with the emphasis on psycho), Queen of Earth opens this Wednesday (8/26) at the IFC Center.